SPECIALTY IMAGING DIGITAL GRAPHICS M agnetic signs continue to increase in popularity as the sign industry finds new and creative ways to use them. Car magnets, menu boards and retail wall graphics are just a handful of the uses clients are coming up with for magnetic or magnetic-receptive materials. Mike Gertz, marketing manager for Master Magnetics in Castle Rock, Colorado, says that vehicle signage is the most popular use of his company's materials. It used to be that a company would have to print an image on vinyl and then laminate it to magnetic sheeting but, today, a lot of manufacturers, includ- ing Master Magnetics, have direct-print options. "It makes it more cost effective because it is faster to print directly onto the magnet for vehicle signs, refrigerator magnets or calendars," he says. Realtors, plumbers and other profes- sional service contractors are very inter- ested in magnetic reminders of their services, including sports team schedules with their company logos on them. Retail point of purchase displays using magnets are also becoming popular because magnetic graphic systems allow customers to easily change out and layer different graphics. Because the magnetic- material can have a magnetic attraction to the metal parts in a printer, many people have turned to printing on mag- netic receptive materials that they can then attach to magnetic material adhered to the wall with adhesive. Retailers can make full wall murals this way that they can then attach dif- ferent promotions to. Flex IRON, Master Magnetics' version of magnetic-receptive material is thinner and lighter than magnetic sheeting and it doesn't have a negative interaction with the metal in a printer, Gertz says. 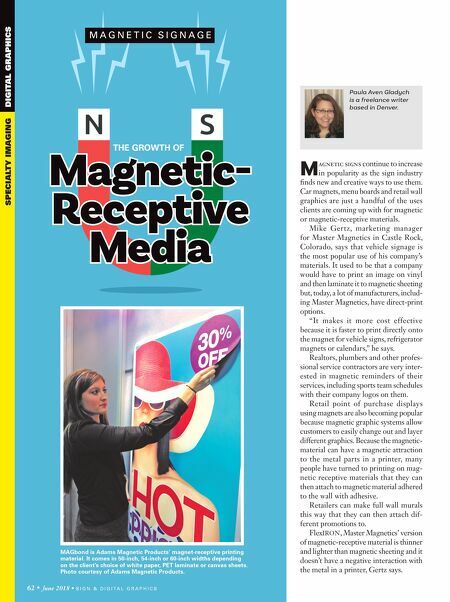 From vehicles to P.O.P., new capabilities keep magnets among the most versatile signage substrates B Y P A U L A A V E N G L A D Y C H Paula Aven Gladych is a freelance writer based in Denver. 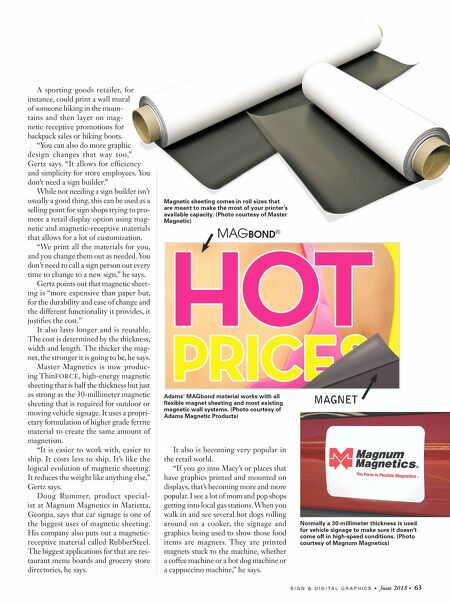 M A G N E T I C S I G N A G E Magnetic- Receptive Media THE GROWTH OF 62 • June 2018 • S I G N & D I G I T A L G R A P H I C S MAGbond is Adams Magnetic Products' magnet-receptive printing material. It comes in 50-inch, 54-inch or 60-inch widths depending on the client's choice of white paper, PET laminate or canvas sheets. Photo courtesy of Adams Magnetic Products.